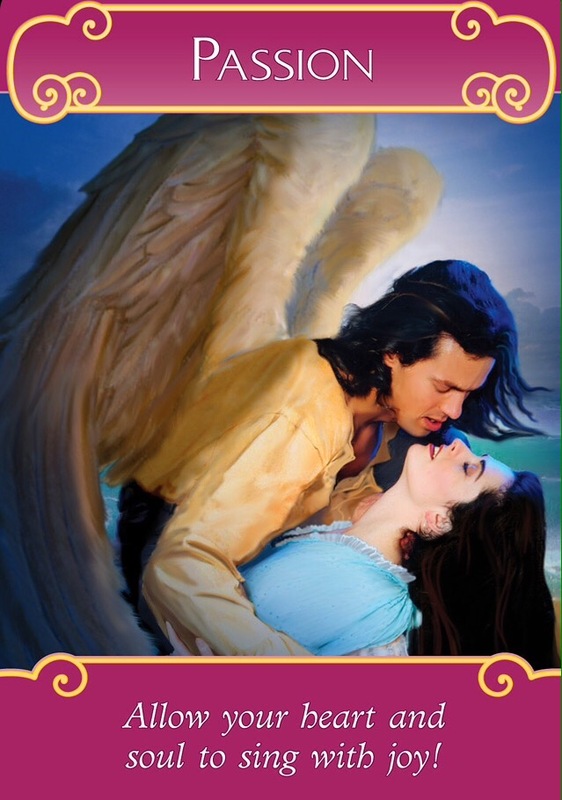 Card: Passion – from The Romance Angels Oracle Cards by Doreen Virtue. Message from the Faeries: Wooooo! Things are getting a little steamy this week. You are so hot right now, you are on fire! Of course, the scene in this card leaves little to the imagination. The passion between these two is quite obvious. We can see this same kind of passion burning inside of you. This passion could very well be a romantic passion, but we would like to remind you that passion is not limited to your sexual nature. Passion is anything that you feel deeply about. Passion is whatever moves you. Passion is something that stirs the magic inside the depths of your soul. If you desire passion in the romantic sense, one of the keys to receiving this kind of passion is if you are already expressing your passions in other ways. What are you passionate about? What gets you excited about living? What makes you burn inside? Even though we can see the passion burning bright inside of you, we understand that some you might not be feeling it for yourselves. Maybe you aren’t feeling well emotionally or physically, or don’t feel you have time for your passions. We know you are doing the best you can to get by, but we strongly urge you to still make the time for yourself to express and experience something you are passionate about. It will make you feel so much better in the long run. Let your passions burn bright, and shine for everyone else to see. You will be inspiration for others. I had one of those A-ha! moments in the bath this morning. I often have revelations in the bath. I figure it must have something to do with being in the water. Anyhow, while I was in that bath this morning, I was contemplating why I feel as though I have hit some sort of wall with myself these days. For almost two years now I have been going to the gym and trying to take very good care of myself. I’ve been desperately trying to kick my sugar habit, and I have been mostly eating very healthy food. The past few months I have sort of lost interest in all of it. It’s not that I don’t care about myself, and it isn’t that I don’t want to feel good about myself. I think that I’ve just grown tired at feeling like I have to work so hard at being healthy and happy. I remembered today that I had a conversation with some friends the other night, where I was telling them it was so much work to take care of myself. We all agreed that it was hard work to look after ourselves. As I remembered this conversation it dawned on me: No wonder I was tired of going to the gym and trying really hard to be healthy! I had turned my self-care into a job. I was treating it like it was work. I think it’s really important for me to look after myself, and to be healthy and happy. I feel very passionately about it, as a matter of fact. Truth be told, I feel really good when I’m exercising regularly and when I avoid eating lots of carbs and sugar. The thing that I am getting all caught up in is that I’ve made it into something that isn’t fun and I am losing sight of my goals. When I get wrapped up in my fitness app, monitoring my calories and scrutinizing what I eat, I am not allowing myself to relax. When I make a regimented schedule out of my life, eventually I get bored and uninterested. I start to lose my passion when I have turned it into the idea that it’s a full-time job. Being honest with myself here – it does take effort to be healthy and to do activities that I love and enjoy. Obviously if I just sit around all day eating junk food, I’m not going feel very good both physically and emotionally. The thing that I am learning here though, is that if I take myself too seriously and start to lose the joy out of what I am doing, I am missing the point. I don’t want my life to be a make-work-project. I want my life to be full of passion, joy, love and happiness. I want my life to be my life’s passion! So starting today, I am going to return to the passion. I am going to return to the reason why I started on this journey of self-care. I am loving myself and listening to my body. I am giving it nourishment and love. I am giving it lots of exercise and healthy food. I am doing this not because it have to, I am doing this because I want to. I want to feel good. I want to be kind to myself. I want to love myself. I’m not doing this for anybody else, just me. This journey doesn’t have to be hard. It doesn’t have to be difficult. The only reason why it’s been a challenge is because I was approaching it as a challenge. I’ve been thinking it’s difficult and hard, and so it has been difficult and hard. No more! 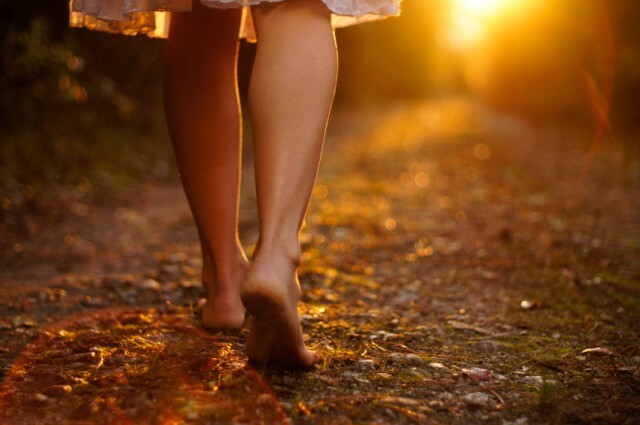 This life’s passion journey of health is walked with ease and grace, with skips and jumps of joy and happiness. Here is to making myself my life’s passion. 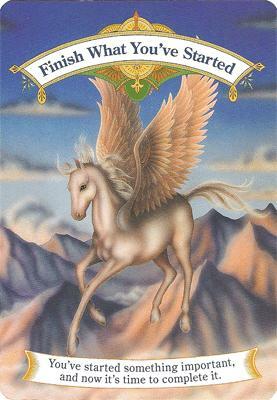 Card: Finish What You’ve Started from the Magical Unicorns Oracle Cards by Doreen Virtue. Message from Erin: Oh my goodness! I am almost dropped the ball this week. I totally forgot what day it was today! I kept thinking it was Sunday and that I had forever to do the reading for this week…only it’s Monday and the new week has already begun! I haven’t totally failed because it’s still the 19th, for 60 more minutes. On an awesome note, I spent the weekend at the I Can Do It! Conference, here in Vancouver over the weekend, and I just spent all day today volunteering at Doreen Virtue and Radleigh Valentine’s Certified Angel Card Reader’s course today. It’s been a very busy couple of days of fun. Let’s get to the reading! (Haha, very funny choice of cards, faeries). Message from The Faeries: This card is a reminder to you this week to finish what you have started. There are many of you out there who have started some very important project in the past year and you have put it on the back burner of your life’s kitchen stove. It’s time to get this project cooking again. Most of you have recently passed through a bit of turbulence, and you are starting to pick up your stride again. Also, many of you have emerged from your winter hibernation. It’s time to get back to work on you passions. There are so many of you out there who have these amazing ideas, books, projects and dreams that you have not finished bringing into fruition, but you have for whatever reason placed at the bottom of your list of priorities. You know exactly what this project is that we are talking about. This isn’t just some hobby, or something that you were working on just for fun, this is work that is part of your life’s purpose. This is something that you came here, specifically in this lifetime, to work on. We understand that “life” has a habit if taking over, and you end up pushing the things that are most important to you into the background, because you have other obligations. Somewhere along the line, it becomes easy to lose sight of what really matters to you, and you fall into the pattern of getting caught up in the mundane. It’s a pattern that is ingrained into most of you. The great news is that you can easily break out of this pattern by consciously deciding to re-prioritize what truly matters to you in this lifetime. You have this desire that burns inside of you. It’s time to re-stoke this small flame into a fire and let your passions burn.